A menu is one of the great Real World content formats that hasn’t yet celebrated its 200th birthday! Because of its brilliantly useful form, however, the menu has taken over much of the way we access information today on computerized venues – computer software programs of every stripe, electronic devices, and electronic games. This shouldn’t be too surprising. In the family line, the menu is the offspring of a table of contents, an information form that has been with us, in English, for about 600 years. 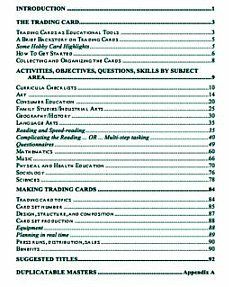 Set at the beginning of a work, the table of contents provides readers with a menu of what they will find within its covers set within the specific order imposed by its author. The other famous family member, over 400 years old, is the index – a list that points its reader to an exact point of reference. Set at the back of the work, the index provides the reader with a menu, in alphabetical order, of words and phrases that the reader might find useful to access and on which pages to locate that content. Over the course of many centuries, as books came to parcel sections of knowledge, tables of contents and indexes became required features. Today, each of these components is also hard at work on most websites – in the form of sitemaps, indexes, onsite search features and keywords! 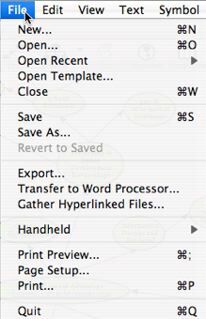 So it is easy to understand how the computer has come by its menu application, too - the drop-down menu. Just joining the rest of the family! What happens during menu reading activities? And like the rest of the family, the restaurant food menu is a highly stylized presentation of information – organized and just itching to help. a) Start here to begin a class Survey - of Menus from places to eat! b) Continue with a class of Language Study - of delicious Menu descriptors - adjectival words and phrases! c) A follow-up class identifies a new Consumer Market for a new menu! d) Continue to Create Menu Items that appeal to the new market! e) Branch out to choose image and colors and more in Designing the Menu that best captures the new market! f) A final class to create a suitable Menu Entertainment Insert just in case service is a bit slow! 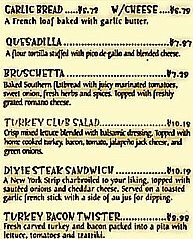 Click here to serve one Menu Favorite in three different menus versions! Click here to make a Menu favorite in a How-To Demo! Click here to Budget for that Menu order... for two... or more! Click here for a tasty guided Language Project in Menu Reviewing and writing and sharing! Click here for a taste of DJ Menu planning! Click here to see how Software Menus fit in! Here you'll find Electronic Device Menus served up, too! Click here to help students test their textbooks' Tables of Contents - the author's own Menu! 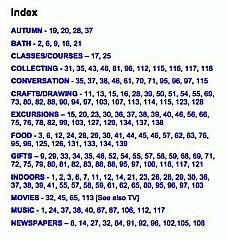 Click here to play with the stalwart Index - an alphabetized Menu always ready to help!